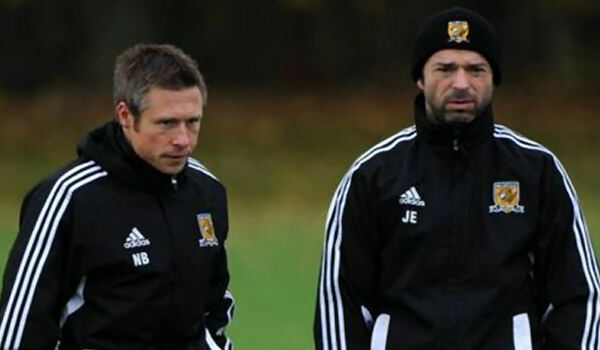 The four year deal signed with Umbro to supply kit to The Tigers will soon bring to an end City’s (sometimes fractious) four year association with the brand with the three stripes. Whereas the boldly striped, turnover collared home shirt adidas made for The Tigers between 1979-1982 is still spoken of in reverential terms (despite it being modelled by some of the worst performing City squads in club history), it is fair to say we haven’t had a truly classic home kit from adidas since they became supplier for a second time in 2010. That is in part because other (highly visible) teams have shared the same templates as us, and having an unpalatable sponsor splashed across some of the garments has harmed overall perception of them. Sponsor desirability aside, we reckon that adidas have done a better job with the away kits over the last four years than with the primary uniforms, and wondered where some away kits would rank when all eight distinct kits worn over the last four seasons were grouped together, so after a team huddle, we’ve put together a HCK ‘power rankings’ of adidas City kits used between 2010-2014. 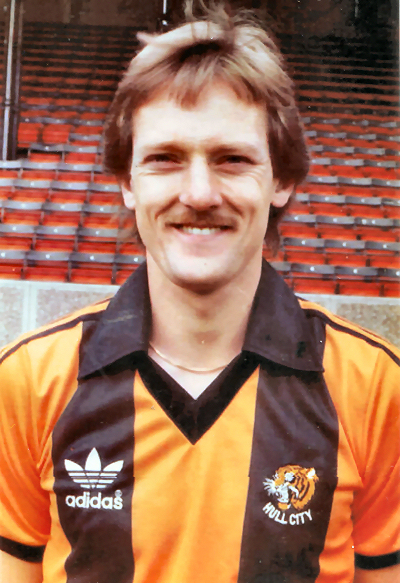 We’ve tried not to consider feats achieved by the team wearing it when wearing each strip, the example of the 1979-1982 home kit shows that a uniform set can be considered classic even if The Tigers were terrible during the period of its use. 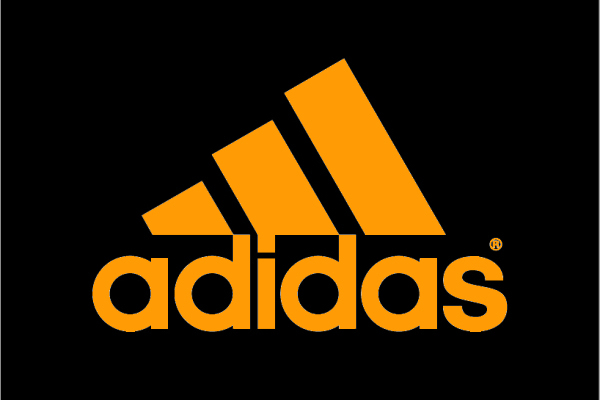 In the absence of a classic home shirt, the nearest adidas have come to producing an iconic kit for The Tigers over the last four years is the all black with amber trim away set used in 2012/13. This kit gave City a brooding, menacing look when on their travels, and was sometimes used just because it looked good, not because there was any kit clash, such as at Elland Road in a memorable win over Dirty Leeds. In a perfect world there would have been a small amount of contrast amber trim on the collar and it wouldn’t have the Cash Converters logo on the front (a decision way beyond adidas’ making), but even advertising a tat shop couldn’t taint the majestic appearance of this kit , which had its own set of amber alternate shorts (distinct from the amber alt shorts designed for the home shirt) that were used just once, in a League Cup clash at Doncaster. You wouldn’t want to have seen that look a lot, but it was a striking matchup and a handy alternative.This kit was used less after City signed a player with some level of colour blindness, causing City to go more with the home shirt with amber shorts and socks, but it was nonetheless a lovely set and the best produced in the four years being supplied by adidas. Though we’re happy with the occasional change-up, we prefer to see City wear traditional all-white when playing on the road when a change kit is necessary, and adidas nailed it with the 2010/11 away kit. The set features just enough amber trim to make it unmistakably a City away kit, while also offering the flexibility of mash-ups using parts of the home kit. This happened a lot during our first season after relegation from the Premier League, the white shirt was worn with black shorts more than once, and sometimes with the black home socks too. 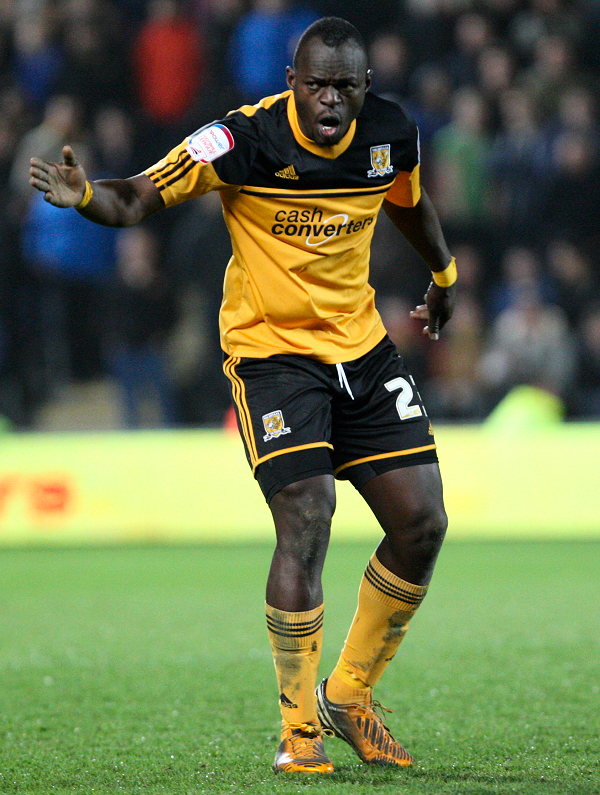 The white shorts were used with the home shirt on occasion, such as in the televised win at Preston. The back of shirt sponsor above the player names didn’t look as jarring as it did on the home shirt that year, but the strip would have benefitted aesthetically from it not being there at all, and that can’t be pinned on adidas. Having the adidas logo on the breast as opposed to being centrally positioned would have looked more balanced, but this was still a lovely kit that ticks all the boxes on a requirements of a traditional City away kit checklist. It’s all about the socks for us, where the 2013/14 home kit is concerned. We’d been hankering for hooped socks for some time so yelped with glee when they made a return. Black socks with striped shirts can make the overall set look too dark, and amber socks often look washed out compared to the shirt ( that’ll happen with different materials), but if you have hooped socks that are black and amber in equal measure, the amber looks right and you don’t have to change when away if the home team uses solid black hose. The shirt is just fine too (apart from the sponsor which is blah, blah, blah you know our views on the tat shop by now). Thick stripes? Ding! That’s always the starting point of a good City home kit. The collar, which reverses the stripe alignment, is a contemporary adidas staple (it appears on Bayern Munich’s Champions League shirt) and we’re not as fussed as some by the angular black sleeve panels so the competition patch doesn’t get applied unevenly over adidas’ trademark three stripes. The one benefit of that black sleeve panel is it allows City’s kitman to be able to issue black compression undershirts rather than amber, as the white elastane hidden within the form fitting garment makes the shade of amber hard to get right. 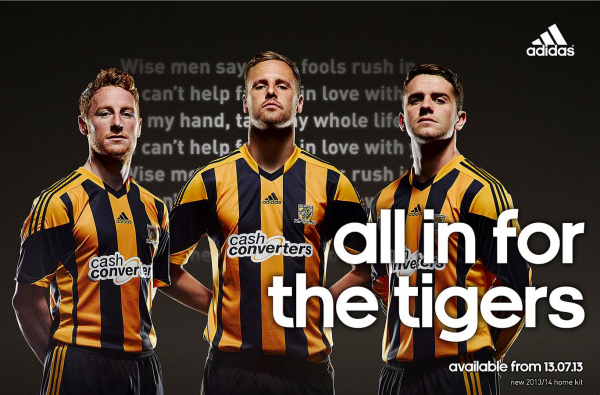 What is poor is the embroidered club crest, which looks shrunken and distorted, giving the tiger a bozz-eyed appearance. The shorts used give the kit SOME distinction from West Brom, who have the same shirt and socks template, but our true love is the glorious pair of hooped socks which elevate this over other recent /// home kits. If we had our way, we’d always have striped shirts and hoopy hose. Light blue was once a home kit colour for Hull City, when amber dye was prohibitively expensive post WW2 and blue dye was readily available from local firm Reckitts, at the time the world’s largest supplier of blue pigments. As a result, it makes for a welcome change kit colour when we’re not in all-white or all-black. This shade of blue was termed ‘Argentina blue’ by adidas and the shirt was normally paired with white shorts though on occasion alternative navy-blue shorts were used. Featuring a simple collar, white piping trim and a shadow pattern of shiny horizontal bands on the front, this was a rather nice away shirt. Early concept images showed the same horrific black sponsor patch that blighted the home shirt, totally unnecessary on a solid colour shirt, but the club responded to online criticism by removing the patch, to their credit. It isn’t the most memorable of away kits, but it was decent, and found use as a third shirt in 2012/13 when the all-black away kit wasn’t sufficient to prevent clashing. Derby used the same template for their home shirt, but that isn’t anywhere as near as annoying as sharing the same home kit template with another team from the same division. Never has a perfectly functional City home shirt been so sullied by the application of a sponsor patch (and before you suggest the Needler’s Sweets patches on the front of Pelada’s leopard spot aberration usedbetween 1993-95, that was far from being a perfectly functional home strip!) 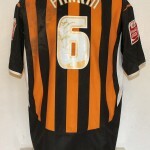 as on the 2001/12 home kit. As in the season previous, adidas gave us the same template as they supplied Stoke with, and that’s frustrating, but critiquing this set from only a City kit perspective, this is a decent strip before the sponsor patch is added, and we saw that when it was used san-sponsor for the ‘Legends Game’ part of Andy Dawson’s testimonial year events. Bold stripes on both front and back always get our approval, and having plain amber sleeves brightens up a kit that can look quite dark if (as is usual with striped shirts) black socks are used with the black shorts. It wasn’t just the sleeves that were plain amber on this shirt, as the yoke sections were tonally solid too, and though the extended, overlapping collar piece looks like it was inspired by a pharmacy staff uniforms, it looks just fine. Some parts of the shirt were made of a mesh material to help with sweat wicking, and as a result some panels looked to be a different shade of amber than others when vied from some angles (or when the shirt was wet). This happens on all kits, but is less obvious on a red or blue shirt than it is on amber, but given that it’s part of a performance garment that needs to have moisture dissipation properties, we think it should be overlooked. 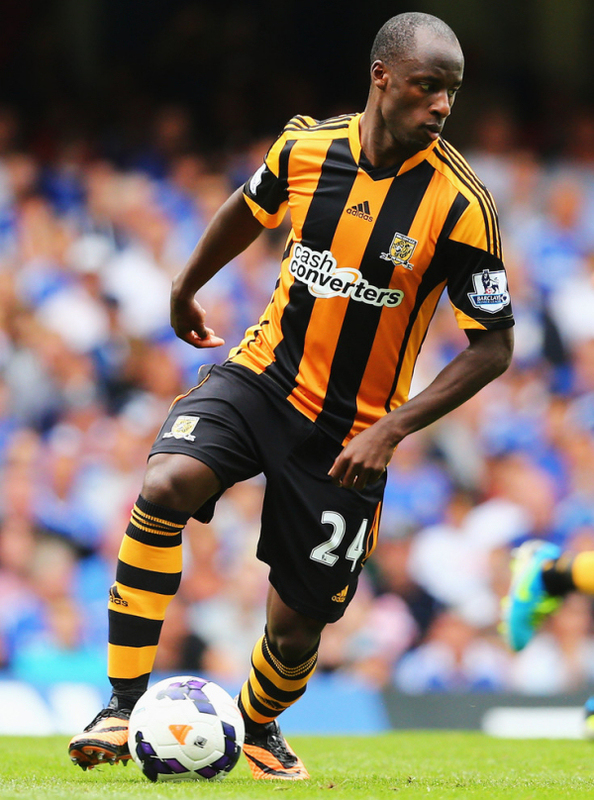 Peel off the sponsor, and this is a decent Hull City home kit. 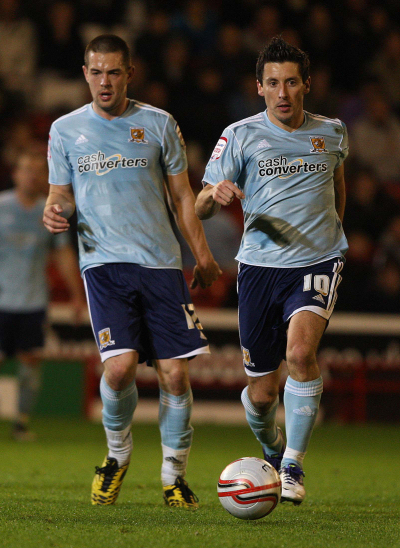 The only non-striped home shirt during adidas’ four year run was used during City’s 2012/13 promotion campaign, and it wasn’t quite solid amber, because of a large black panel on the front. This is an ok kit but not one that causes excitation, though it is notable for working well when paired with amber alternative shorts. Ordinarily amber shirts matched with shorts and socks that are also amber lack sufficient contrast trim to stop the tone looking pale and washed out, but the hefty black panel on the top part of this shirt meant the amber still ‘popped’ and didn’t appear to be same shade as a faded dishcloth. 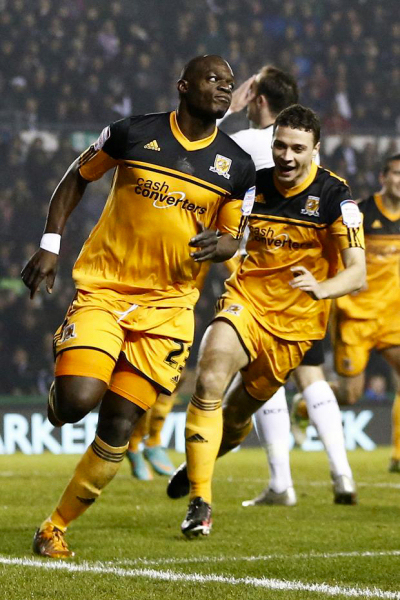 The promotion, sealed on a chaotic final day of the season, is what will keep this kit in the memory, not the design, which Fulham have used as an away kit in 2013/14, The Cottagers wore their red and white version for the 6-0 thrashing at the KC Stadium. The use of high blue and red for an away kit got some people’s goat when this kit was first released, and some fans voiced displeasure at the unbalanced look created by having red socks with blue shirts and socks that don’t have much red trim to link the full kit together. 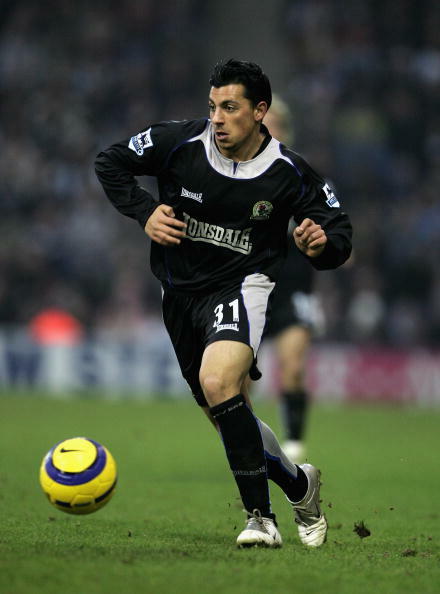 We feel it’s ok to throw something different in now and then where away kits are concerned, such as when we went purple and white on our travels in 1999/00, as long as we have an away set that looks like it’s a City kit more times than not. 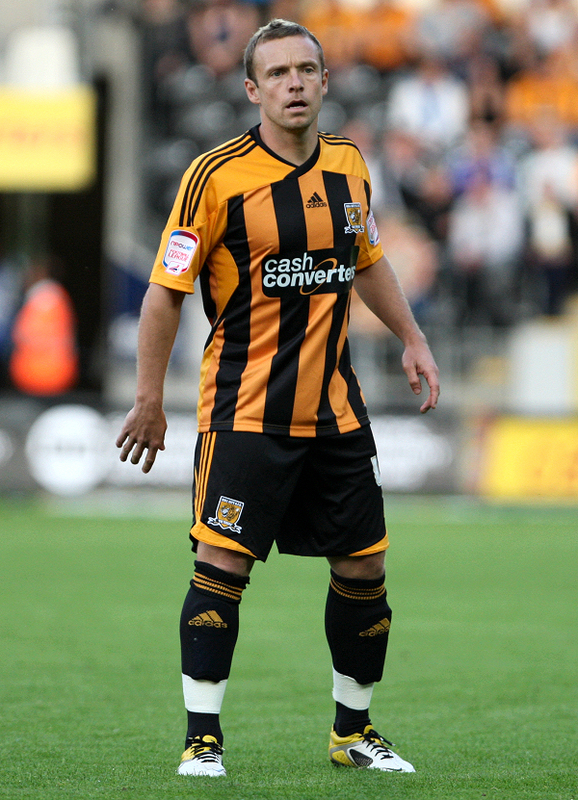 On that charge, this kit is guilty, nothing about it says Hull City, even if blue is a main colour of the city’s civic crest* and even though City have worn blue as a home kit, in the 1930s. 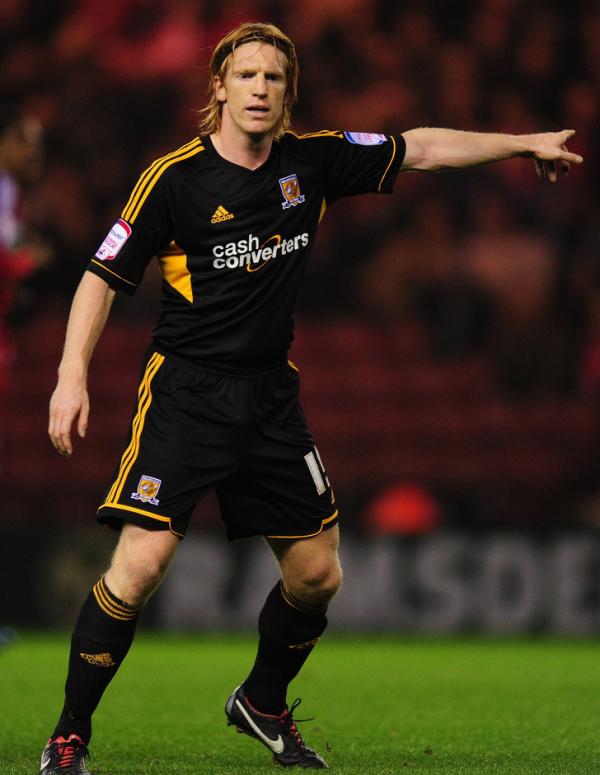 This is an alright football strip, even with the red socks (that were sometimes replaced with white hose when the home side had a predominantly red kit, creating a Chelsea-ish look) but as a Hull City kit, it doesn’t get much love. *Thinking about the civic crest (of three stacked coronet crowns in gold on a field of blue), a mostly blue kit with metallic gold trim would say ‘City of Hull’, if not Hull City. Maybe not a bad idea for 2017 when our fair port is celebrated as a city of culture. 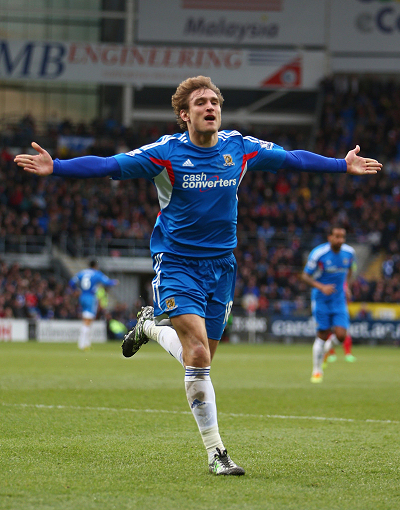 The first home kit of the 2010-14 adidas deal was based on a template also used by Stoke. Fuzzy stripes had been popular on the continent in the preceding few years, especially in Italy where Juventus and both Milan clubs had their black stripes rendered in a blurred or softly defined manner. 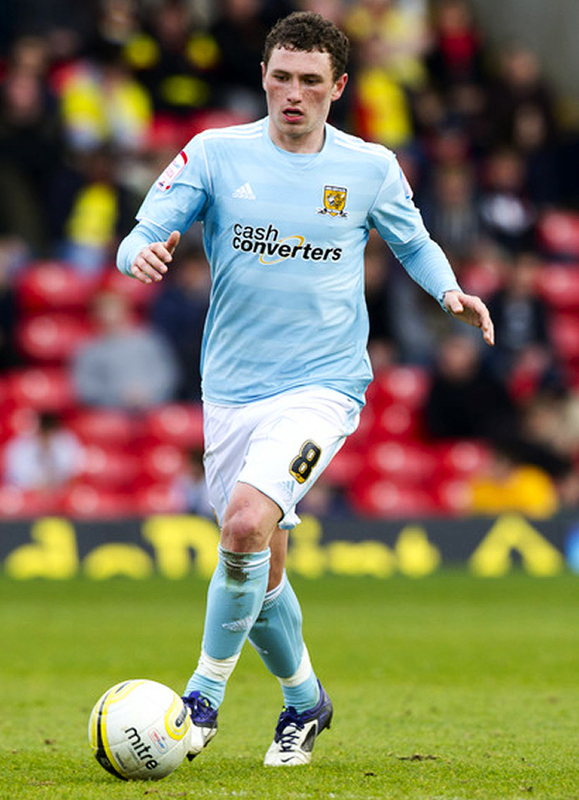 The stripes on this City shirt had the look of oily tyre tracks, which wasn’t a great look, yet having them on both sides of the shirt would have at least made the kit look balanced, the back panels on these shirts were plain amber (and sullied by a back of shirt sponsor advertising ambulance chasers Neill Hudgell Solicitors, that was unwisely placed above the player names and applied in blue and red) that created an odd effect when one City player faced forwards and another player faced them, making it appear that City players had different, non-uniformed shirts on. That goes against the entire point of a football kit, which is to definitively identify who is on the same side. Having fuzzy stripes on the back would have meant using white for the screened on player names, squad numbers and back of shirt sponsor, which would have looked far smarter, and having a back of shirt sponsor (which served to highlight our parlous financial state after relegation from the Premier League) underneath the squad numbers on player shirts would have looked better than having two stacked rows of text in different typefaces, which was a cluttered and messy combination. Some fans didn’t like the way the club crest looked or how it was applied. It was similar in appearance and construction to the Lextra competition patches heat bonded onto the sleeves of all nPower League teams.The two layered patch featured a printed felt tiger head and club name over a shiny, woven amber field, creating a multi dimensioned look. Like sleeve patches, the crests were ironed on rather than stitched on. With solid stripes printed on both front and back panels, the back of shirt sponsor applied in white underneath the numbers and an embroidered crest, this kit’s shirt would have looked far better, but as it is, it’s the main part of the worst of the four home kits and in our mind, the worst overall. Our black away strip is indeed beautiful but for me it’s the 13/14 home kit. The hooped socks seem to make us look big and strong. It’s the perfect design for our colour scheme. West Brom, Stoke and Sunderlands kit don’t seem to have the same impact. A special mention to this years keeper strip also surely? I thought I’d keep goalkeeper kits out of it as they are just templates used by all the adidas clubs. I do like the Dark Shale kit though. The 10/11 away kit is so underrated and in my opinion nicer then the 07/08 white away by Umbro. The 13/14 Home is the best home kit I’d agree with you on that definitely but overall Adidas when looking back on the 8 kits didn’t do too bad a job really. All the 4 away kits in particular are very smart. 10/11 seemed to have so many mashed up kits on our travels THOUGH WHICH I think ruined everyone’s image of the kit.